To eliminate or minimise the effects of certain error sources, coating thickness meters may need to be calibrated for proper measurement. The left drawing shows the probe of a device that is to measure a coating on a flat surface. The device is adjusted to display the proper coating thickness on flat surfaces without additional calibration in the factory. It can be seen that the magnetic field curves exit the magnetic pole of the probe, penetrate the unmagnetic layer "paint" and enter the iron body. The medium length of the field curves between the magnetic pole and the magnetic basic material is proportional to the coating thickness. The measuring probe "recognises" the length of the field lines, converts them into a measuring signal and displays them as the coating thickness. If the same probe is applied to a cylindrical workpiece (right drawing), you will see that at the same coating thickness the field lines are longer than on the flat surface. In this schematic example, a larger coating thickness than actual would be displayed. This effect that impairs coating thickness measurement can be removed completely by the simple process of calibration. Where a geometry change causes a significant difference between field line length and coating thickness, calibration is suitable. When measuring with the eddy current method, similar effects can be observed as when measuring on curved surfaces. 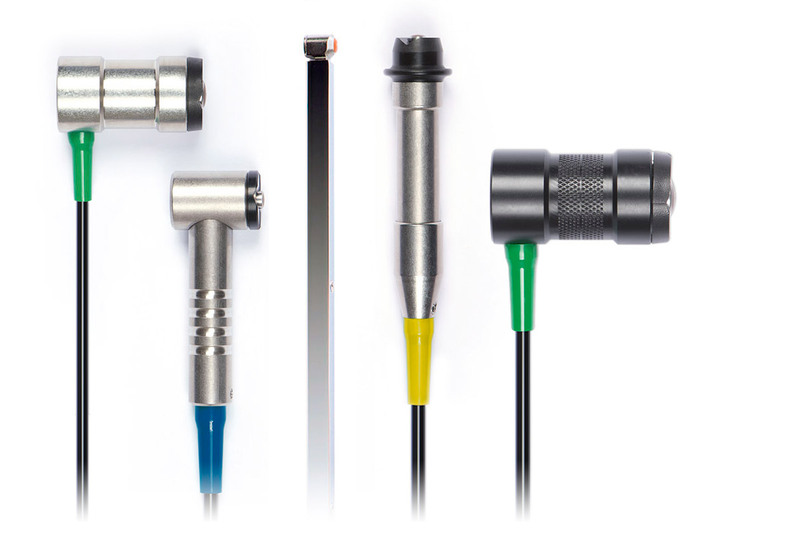 The term of one-point calibration has been chosen because the characteristics curve of the probe is specified only with one reference point, which is the zero value (coating thickness zero). This calibration type, also called zeroing, requires no foil standards. It is used for measurements on parts with smaller sizes than the standard geometries. One-point calibration is also chosen when the desired accuracy is to be higher than when using factory calibration. Zeroing is performed on an uncoated test piece that corresponds to the test object except for the coating, by multiple application of the probe as close as possible to the point that is to be measured later. This calibration type requires a calibration foil whose thickness should be known as precisely as possible. It is chosen when the desired accuracy should be higher than at zeroing. The term “two-point calibration “ is used because the characteristic curve of the probe is determined by using two points: “zero” and “foil value”. To achieve a high accuracy, you need to select a foil standard for calibration that has a thickness that exceeds the expected layer thickness slightly, but no thicker than 1.5 times that value. Two-point calibration requires zeroing first. Then the calibration foil is used for another calibration. For this, the foil is placed on the uncoated test piece and the probe is placed in the same location that was zeroed before. After multiple application of the probe, the arrows at the device are used to change the displayed thickness value until it corresponds to the thickness value of the foil. Now you can measure on corresponding measuring objects. 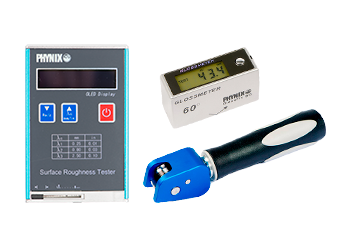 This calibration type is particularly used for measuring rough, e.g. blasted basic materials. It is also suitable for weakly magnetic basic materials when measurements are performed either according to the magnetic-inductive method or according to the eddy current method. For this calibration type, two differently thick calibration foils are used. The thickness of the foils should be chosen so that the thinner foil is 0.5 to 0.9 times the expected layer thickness, and the thicker foil 1.1 to 1.5 times the expected layer thickness. The two-foil calibration specifies two reference points of the probe characteristic curve, i.e. for the thinner and the thicker foil values.